The virtues of Leon McCawley’s Chopin playing are impressive, which will come as no surprise to those who know his earlier recordings. These beautifully recorded performances are characterised by a refined musical intelligence, cultivated taste and lack of exaggeration. Leon McCawley has already recorded a wonderful disc of Schumann’s solo piano music so it is good to see that he has elected to concentrate on Chopin in the bicentenary year. The contributions to the Chopin celebrations have been varied but this disc must be among the very best. McCawley’s piano playing is exemplary throughout: wonderfully clear, expertly articulated and executed, the virtuoso demands of the works handled with ease, and with beautiful tonal contrasts. The opening “Minute’ waltz was charming and graceful while the ensuing Ecossaises – which are rarely played by pianists nowadays – were light and playful with their technical demands handled with complete ease. McCawley really captures the joyous spirit of the dance with these works and the filigree passage-work is very well executed. The mood changes with the Op. 6 and Op. 17 mazurkas where McCawley brings out their melancholy and introspection. Nuanced rhythmic playing, immaculately judged textural variety and artful articulation serve to bring out light and shade. McCawley really lifts the melancholy mood with the joyous and rhythmically playful third Op. 6 mazurka, while the first Mazurka of the Op. 17 set was wonderfully uplifting and affirming. McCawley ends the two sets with the profound A minor mazurka where he conjures up an atmosphere of hushed sadness. McCawley’s virtuoso technique comes to the fore with the four impromptus; the considerable technical demands of these works were dispatched with complete ease. McCawley also displays a wonderful sense of classical poise and balance and brings out the music’s structure and architecture. The passage-work of the first Impromptu was dispatched effortlessly and there was some lovely and playful rubato. The second Impromptu had wonderful tonal contrast. The pastoral opening was followed by a thrilling central march section but with McCawley maintaining a beautiful tone throughout. The demanding filigree passage-work at the end of the second Impromptu was played delicately, and made to sound a seamless part of the thematic material rather than mere ornamentation. The third Impromptu was graceful and tastefully played. McCawley elected to have quite a fast tempo for the Fantasie-Impromptu. The right-hand figurations were delightfully shaped and crafted and melded smoothly into the lyrical central section. McCawley’s playing of the two nocturnes Op. 27 was again technically flawless and the tone alluring throughout. There was some impressive left-hand legato playing in the C sharp minor nocturne, while the ornamentation in the D flat was quite exquisite. McCawley elects to finish his recital with the F minor Fantasie. This provided him with an opportunity to display his full technical repertoire: a lovely tone and phrasing, wonderful and playful tonal contrasts, and virtuoso passage-work executed with ease. The clarity of the playing was admirable throughout and once again McCawley brought out the cohesive architecture of the piece. This is an outstanding recital. McCawley’s playing is perceptive, elegant and modest. In his hands, the four impromptus form a cherishable set. Transparency of texture is key to his approach, notably in the tarantella-like outer sections of the A flat major Op. 29 and in the Fantasy-Impromptu, but the lingering line of Op. 36 shows a fondness for lyricism. Here is a true salonist, but one who has no recourse to sentimentality. His Nocturne in C sharp Op. 27 is certainly special: he weaves a mesmeric harmonic haze in the left hand beneath an exquisitely spun melody, and the coda is beautifully intimate. The Fantasy is big-boned where it needs to be and provides ample drive without recourse to rhetoric. Chopinistas will find these readings both absorbing and illuminating. Leon McCawley’s new Chopin recital on Somm is a fragrant bouquet of the most delicate, rainbow-hued blossoms, each lovingly chosen. This is Chopin playing of a kind rarely encountered these days. Understated and subtle, its poetry unfolds in an atmosphere of hushed intimacy. The four Impromptus, as a group are expecially successful. Unencumbered by any inappropriate portent or extravagance, McCawley allows them to speak with all the spontaneous insouciance suggested by their title. The furious C sharp minor Fantasie-Impromptu is certainly as driven as one could want, but it too retains its sense of a fleeting impression. The two exquisite Nocturnes Op. 27 fairly glow in these original interpretations. Moments of the C sharp minor are a little scary, yet whatever spectres McCawley conjures these are soon dispelled in the luxurious sensuality of the D flat major Nocturne. The two early sets of Mazurkas are perhaps the most beguiling. All eight of these splendidly realized dances strike the perfect balance between rusticity and sophistication. The elusive tempo rubato, without which Chopin’s mazurkas are meaningless, is cunningly wrought. Listening to the last of the Op. 17 set is tantamount to holding the hand of a friend whose heart is breaking. What the D flat major Waltz lacks in extroversion, it makes up for with charm, and the three Ecossaises are all snap and sparkle. The longest piece on the disc, the F minor Fantaisie, seems less the narrative of so many interpretations but rather an inspired improvisation, kneading and coaxing the instrument’s sonorous potential. One wonders if, as he plays, McCawley holds in his imagination a picture of the historical Chopin- the pianist who shied away from large rooms filled with people, preferring the intimacy of the salon; whose physical strength, diminished by years of illness, caused him to cultivate a realm of subtle nuance within a circumscribed dynamic range; whose compositions and performances set the contemporary bench-mark for taste and refinement. His interpretations suggest that he might.His playing is never projected but conveyed in the tones of a private conversation. Textures are translucent and pliant. Above all, McCawley always maintains focus on the life of a phrase, which lends his playing that natural cantabile one expects from the finest singers. Add to this the sway and lilt of an infallible tempo rubato, so natural as to seem inextricable from every gesture of the pleasure this disc affords. As the Chopin year drew to a close, Leon McCawley added his own personal and distinctive voice in performances which veer away from the concert hall, almost as if given before a late-night audience of carefully chosen friends. His inwardness and reserve pay rich dividends in the C sharp minor Nocturne’s coda, where Chopin’s gloom and despondency are finally pierced with light. And in the companion Nocturne in D flat, his translucent tone is particularly apt in so much sumptuous cantilena and double-note blossoming. He is notably at home in the darkness and pained introspection of the A minor Op. 17 No. 4, and, per contra, is deft and stylish in his curtain-raiser, the “Minute” Waltz, where he is too musicianly to become involved in a superficial race against the clock. Here is one the most beautiful performances of Chopin’s piano music I have encountered. It is absolutely perfect. If you don’t want a blockbuster set, like Murray Perahia’s five-CD compilation on Sony, or the new series under way on Chandos with the spectacular Louis Lortie, which will be a completist’s nirvana, then look seriously at this. It is a collection of two sets of Mazurkas, three of the Impromptus, a couple of Nocturnes, the Ecossaises, the warhorse Fantasie-Impromptu and the F minor Fantasie. The playing, by the fine UK pianist Leon McCawley, is out of this world in a number of respects. In its pristine clarity, discretion and poetic intimacy it is frankly astonishing – it sounds like he is playing an upright in your living room, just for you. This is how Chopin intended his music to be heard. There is not a barnstorming moment in the performance: the nostalgia and melancholy are there, without a whiff of sentiment. Wonderful collection – seek it out. 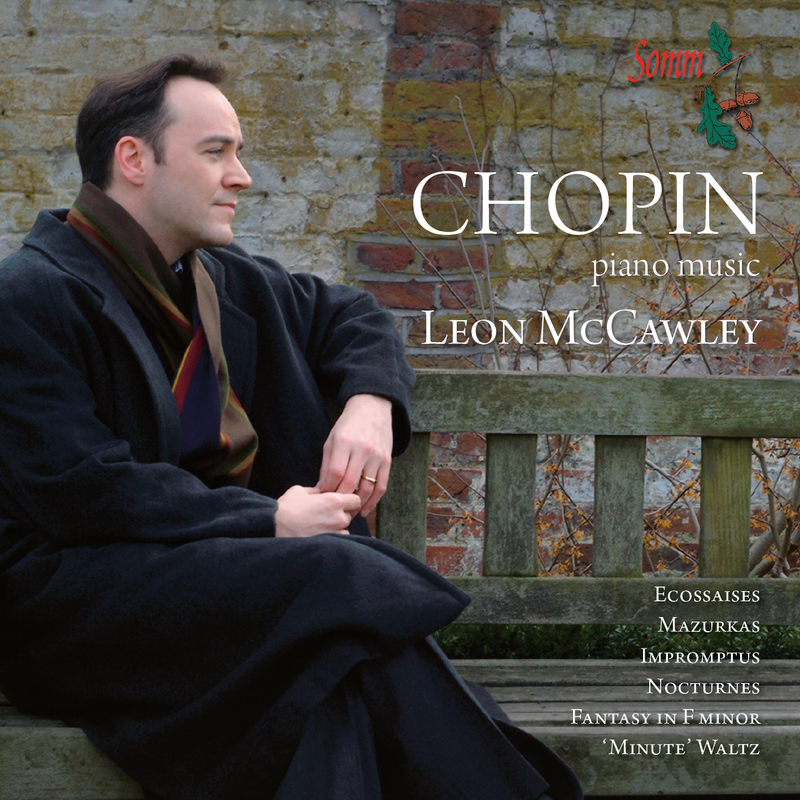 McCawley, an English pianist with a rising profile, offers a self-effacing introduction to Chopin…He is best in the Three Ecossaises Op.72 and the Impromptus Op.29, 36 and 51, where he captures the music’s salon-like elegance without sentimentalising it or showing off. The bicentenary of Chopin’s birth changed none of my perspectives. There have been some interesting recordings…and some teeth-gritting horrors…, not to mention some ear-tweaking interpretations on creaky pianos of the composer’s time. None prompted me to regard Chopin from a fresh aspect. There were, however, hidden gems and whispered secrets, one of which was Leon McCawley’s account of the Fantaisie Impromptu on the Somm label, which is today’s exclusive free download on Slipped Disc. A runner up in the Leeds piano competition , McCawley is a young British pianist with exceptional tone control.